Open since 1999, Foreign Cinema restaurant has garnered local, national and international acclaim as a quintessentially San Francisco dining experience. Offering a daily changing California/Mediterranean-inspired menu in an industrial chic setting located in the heart of the bustling Mission district, Foreign Cinema is a unique experience. Dinner is served nightly as well as weekend brunch both Saturday and Sunday. 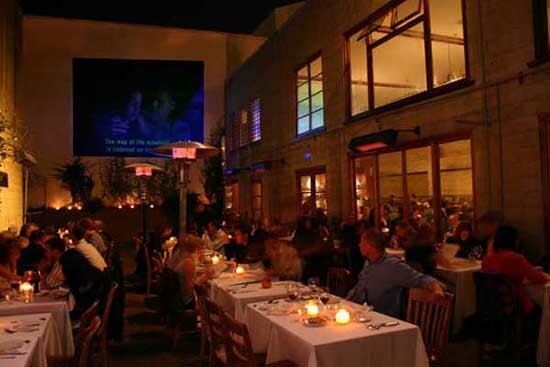 Foreign and independent films are screened in a covered outdoor courtyard, providing an über cool ambience. Even the entrance is reminiscent of an old theater complete with red carpet. Seating is available indoors fireside as well as upstairs in a semi-private mezzanine overlooking the dining room. Guests may enjoy cocktails and a complete menu from the main bar or on the patio outside. In addition to the high scoring ambience, is the high scoring food. Since this was our last night out in San Francisco, I was looking forward to one last splurge. I ordered a glass of Gewürztraminer while Keith ordered a vodka tonic. The light and crisp wine with its bouquet of lychees was perfect for this evening and would pair well with any of the seafood dishes. To start, Keith wanted oysters. No surprise there as he's been on an oyster kick all summer. He described he liked "meatiness" in an oyster and the server suggested the Shigoku variety from Washington. Additionally, we ordered the tuna tartare, that was a little on the small side for the price but was elegantly plated with crisp green apple slices that countered the spicy Thai chilies in the tartare. For my main I took a huge risk and ordered the Wild King Salmon. I have never been a huge fan of salmon, always found it too fishy and oily for my liking, until recently. I've had Wild King Salmon in sashimi form and lurved it. So I deciphered if I can eat it raw, I might just like it cooked. The server warned that the chef prepares it medium-rare, and Keith was hesitant for me, but I said that would be fine (again, referring back to my enjoyment of the raw sushi). It arrived on a colorful bed of chopped seasonal vegetables that had delicate flavor with just a tad too much green parsley. I moved the green stuff to the side and devoured the entire dish, save for one bite I allowed Keith to try. The fish itself was a bit more rare on the inside (more like raw as it was cold), and nicely cooked sous vide on the outside. It was lightly seasoned, allowing the natural flavor to come out and was absolutely delicious! I guess wild salmon is becoming my new favorite fish. Keith ordered the Pork Chop that was cooked medium-rare; yet came a little over done for his tastes, and served with pesto polenta and grilled artichokes. The meat had a nice char on the outside and overall he enjoyed the dish. For dessert we shared the Goat Cheese Cheesecake that had tart berry compote on it. The cheesecake was a perfect finish to the meal - not overly sweet and had nice tang from the goat cheese. Similar to the 5% service charge at Incanto, a 3% charge is applied to each check at Foreign Cinema in support of The Healthy San Francisco Ordinance, which allows employers to help provide health, dental, and vision insurance to those employees who make less than $54K a year. Again, we were happy to oblige and tacked on the extra amount to our bill. The food and unique ambience of dining in a "cinema" were both classy and well executed. We had another memorable meal at Foreign Cinema and it was a wonderful way to conclude our San Francisco dining adventure.